National Maritime Museum opens their new show "The Great British Seaside", with spotlight on Martin Parr's 80s vibrant yet sarcastic lens into British culture and love for seaside. This exhibition couldn't be timed better with this ongoing Summer heat wave, but if you're thinking shots with hot girls in bikini with ice-cream - think again. Martin Parr, as always, captured the very essence of British - sarcasm and humour, enjoying your seaside fish and chips while fighting off seagulls, socks and sandals - you name it. While showing familiar events and seaside activities, the interesting bit to me was how the works reveal an amazing diversity of people who are adapting the traditional British seaside experience to fit their own social, cultural and religious needs. That brings me to think how important it is for museums to rethink their strategy and role, are they there just to glorify a nation's past victories, or are there a place and way to ask viewers to reflect on history by introducing contemporary art pieces - just as how NMM has done to introduce this latest photography show, as well as Yinka Shonibare's 'Nelson's ship in a bottle'. 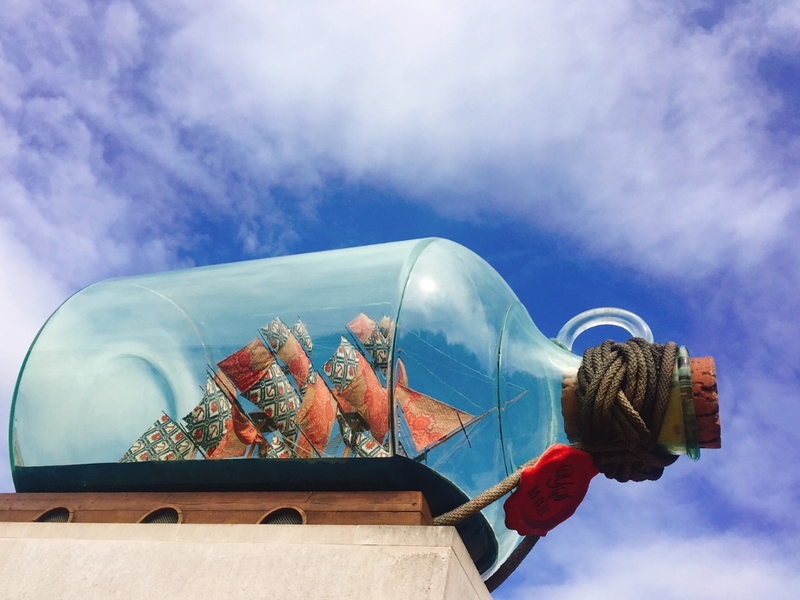 'Nelson's Ship in a Bottle' is an incredibly detailed, scaled-down replica of HMS Victory, on which Nelson died during the Battle of Trafalgar in 1805. It has 80 cannon and 37 sails set as on the day of battle. The interesting bit of the piece were the fabrics used which was inspired by Indonesian batik, mass-produced by Dutch traders and sold in West Africa - as told by Yinka, it acts as a poetic metaphor of contemporary African existence. It captures histories that can be inspiring or brutal, but always complex. It suggests that the opening of the seas led not only to the slave trade and colonization, but also to the dynamic contributions of Africans and African heritage worldwide. Not only it was beautifully crafted, beautiful blue sky reflecting against the glass bottle, the form itself as 'a message in a bottle' calls your attention, as if it's speaking to you, drawing viewers to reflect on a subject more than just a glorified national triumph.